Monday morning at about 4am I sent the Munchkin Apocalypse card database to Andrew. Then I went to bed. I was a couple of weeks behind schedule on this, so we have some catching up to do. Playtest on this one will not be routine, because Munchkin Apocalypse has an alternate victory condition. During the course of the game, the Seals of the Apocalypse will be opened, one by one. Sometimes the players will have control over whether a Seal opens, and sometimes it will just BLAM! happen. If the Seventh Seal is opened, the game ends, and the winning player is not necessarily the one with the highest level! That means that we'll have to balance the rate of opening/closing Seals with the rate at which players gain levels. 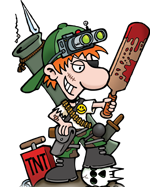 Ideally, some players will find themselves wanting to open Seals and bring down the Apocalypse, while others will be trying to keep those Seals closed and win by collecting levels. I expect that will take some tweaking. At any rate, Sunday night and Monday morning were devoted to monsters. The monsters are usually one of the first things I work on when I create a new flavor of Munchkin . . . but they are almost always the last part finished. There's a lot of fiddly stuff with balancing bonuses and penalties, and there need to be a lot of really stupid jokes, and there has to be a good assortment of Bad Stuff ranging from "Lose a level, duh" to calculations that make your eyes cross. In a perfect set, there's at least one monster that might sometimes make a real munchkin choose to lose the battle. And now it's turned in, and I get to do the Thing After Next, because the "next thing" was to review the Castellan rules and add what we've learned about three- and four-player games, and I did that this afternoon. But not all afternoon, because it was a beautiful day for walking, and summer will be here all too soon. Speaking of walking, I have a Fitbit now. After I've used it for a while, I'll write a little review. But right now, the Thing After Next beckons.